Army Public School And College Sargodha Cantt Punjab. Qualification: MSc. Preferably Ph D/M Phil. 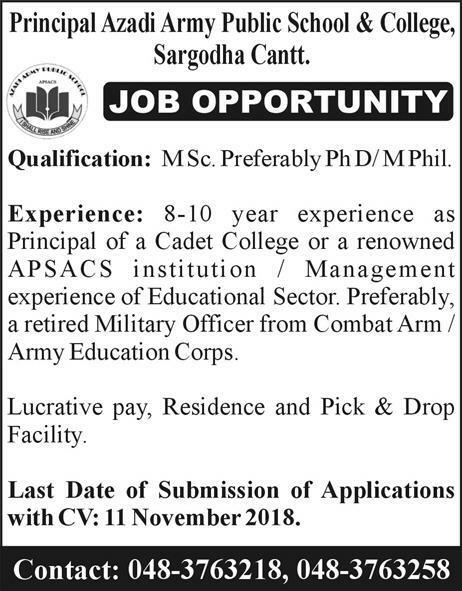 Experience: 8-10 year experience as Principal of a Cadet College or a renowned APSACS institution / Management experience of Educational Sector. Preferably, a retired Military Officer from Combat Arm / Army Education Corps. Facilities: Lucrative pay, Residence and Pick & Drop Facility. Azadi Army Public School & College, Sargodha Cantt. Last Date of Submission of Applications with CV: 11 November 2018.